Little Knut Discovers the Knutnited States of America. One of the problems with writing picture books, I reckon, is the 32 page size limit imposed on them by the size of paper folds. A sheet of A1 paper folded in half, then half again, then one more time, equals 8 sheets of A4. Stitch 4 bundles of A4 together and you have 32 pages, the standard size of a picture book. If you are onto a good story and the ideas are flowing thick and fast, then you can use up all the available space really quickly. 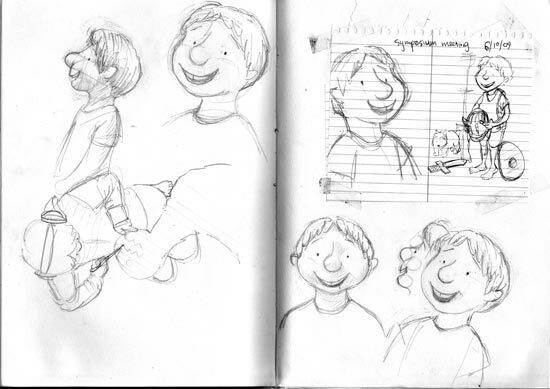 Being a picture book , however, you have to save some space for the pictures, and preferably lots and lots of space if your illustrator is half decent and is on the same wavelength as you. Unfortunately for what I thought were my well chosen words, James is more than half decent and so he needed lots and lots of white space to let his talent run free. In this first daft you can see I was ready to head off on several tangents that appealed to my sense of adventure. It was pointed out to me later on when the plot was coming together, by Cate Sutherland, Fremantle Press’s children’s publisher , that the tangents tended to detract from the core of the story. That is the reason that Knut setting off in his head to discover America and trade with the Indians came to a sticky end. Ironic really, as that is precisely what happened to many of the Vikings that first set foot on Newfoundland. 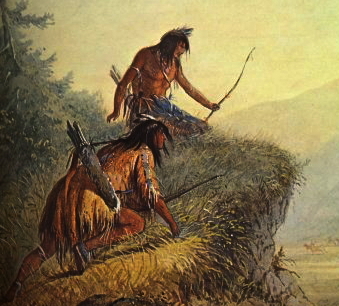 The Native Americans didn’t like them one little bit and fired a multitude arrows in their general direction. 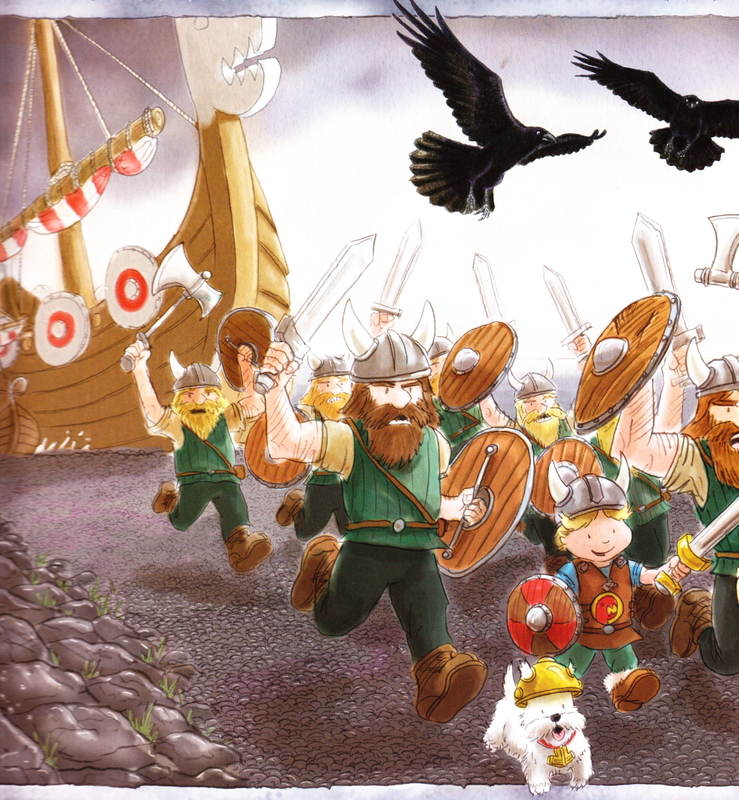 The same thing happened to the scene when Knut and his imaginary band of hooligans decide to attack and burn the monasteries of Northern England. We cut it short and let the reader imagine the consequences of a full-on Viking raid on a monastery full of placid, defenceless monks. Showing monks murdered or being led away to the slave markets and their houses set on fire probably wasn’t all that advisable if we wanted Knut to remain a sympathetic character. Our audience might be a bit young for anti-heroes. 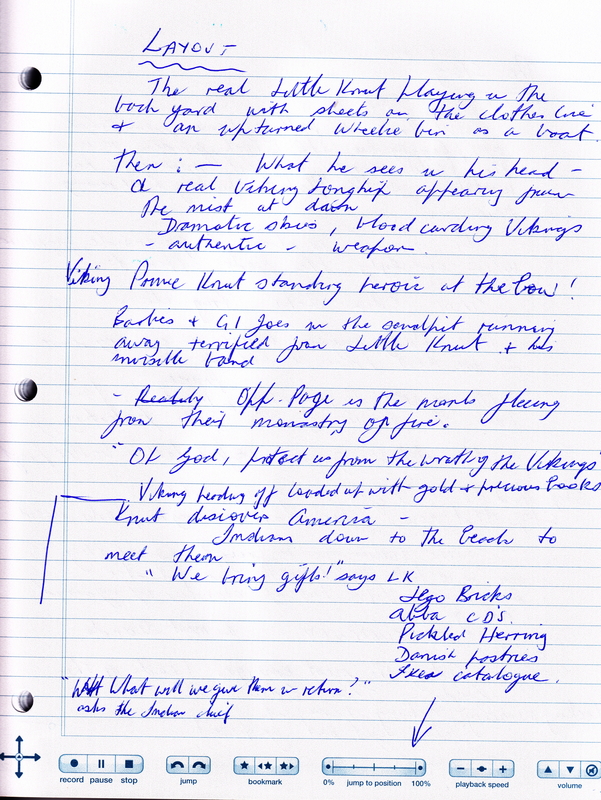 I often say it is so much easier writing novels where the only constraint on the length and number of words is the boredom threshold of the editor. 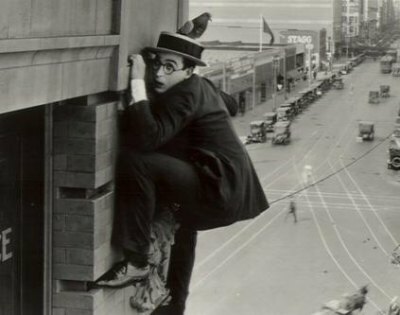 If you can keep her interest up to when the hero is hanging from his finger nails from a two hundred metre high ledge, then you can continue, but the minute the story starts to lag is the time to cut it short. Like about now. Categories: Uncategorized | Tags: cate sutherland, christians, dawn french, Fremantle Press, James Foley, Knut, monasteries, monks, murder, native americans, Newfoundland, Norman Jorgensen, novels, pagans, picture books, Scandinavia, sunday school, united states of america, Vicar of dibley | Permalink. Knut is Dead, Long Live Knut. On Friday afternoon I received a call from Claire Miller, Head Publicity Pixie at Fremantle Press, asking if I’d like to come down to the Press for a beer after work, because, ‘guess what?’ I sort of guessed what what was. So, armed with Carlsberg Danish beer I arrived, and sure enough on the board room table, there it was, a brand new, shiny, out-of-this worldly wonderful, advanced copy rushed over from the printers in China. Unfortunately, James was away on business up in Bruce Rock, a small town out in the wheat belt, and didn’t get the message. So, after two years solid years work by him, he had to wait another 27 long hours to see his artistic masterpiece in all its bound, polished and designed glory. And it certainly is all of that. Claire brought a copy to the IBBY Hans Christian Andersen dinner last night at Villa Roma in Fremantle, and so James and I snuck outside for a while so he could get a first look at his book in the light and not the dim lighting of the restaurant. He seemed pretty pleased. Nearly as pleased as me, in fact. He confessed to feeling a little manic, and I can see why. It is a crowning achievement by him. I didn’t feel manic, just deeply contented at seeing what a great job he has done. In fact, not only James, but also Cate Sutherland, our publisher, and everyone at the Fremantle Press have done, including the lovely traceygibbs.com, as she now calls herself? Tracey Gibbs was Head Designer at the Press and designed lots of heads, and all my previous book jackets, until she went freelance a few years ago. 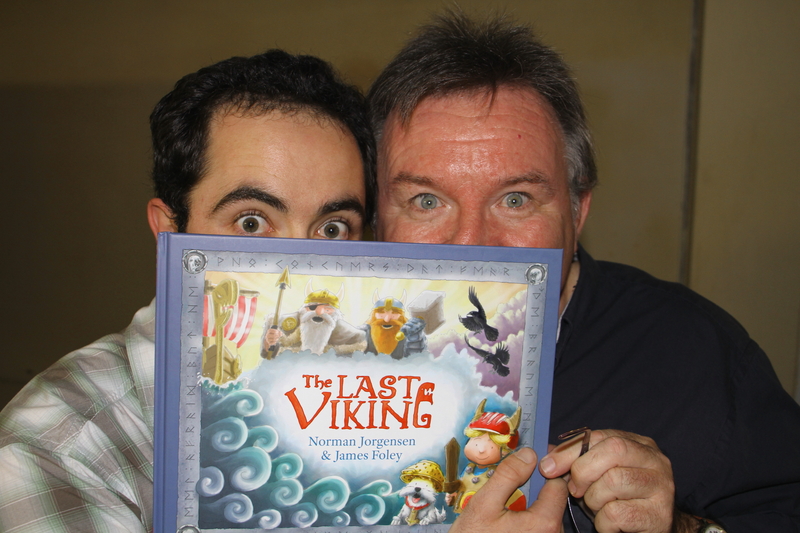 The official release date is June 24th and we’ll have a great big launch on the same day that all Vikings in the entire world (including you) will be invited to (see top right of the blog for more details). I had hoped to have a burning Viking Longship launched out to sea to celebrate the launching, but I’m getting distinct murmurings about water pollution, River Police, as well as Health and Safety, especially with my plan to fire burning arrows from the shore to set it alight. And it will be mid-winter and none of us is hardy enough, like real Vikings, to stand in the cold, pouring rain while me and my brothers fire lethal flaming missiles into the air. The last time we attempted anything like that, the Kalamunda Fire Brigade ended up having to be called. Categories: final artwork, writing | Tags: book launch, Claire Miller, Knut, picture book, polar bear | Permalink. 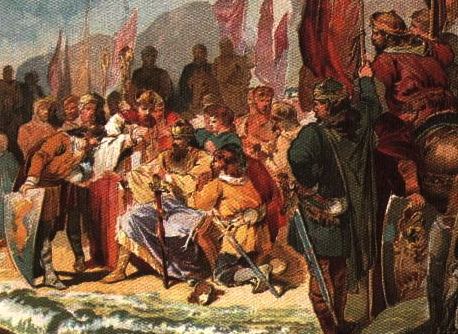 Viking King Canute the Great, known as Cnut in Denmark and Knut in Norway, was the son of Svein Forkbeard and grandson of Harald Bluetooth and great-grandson of King Gorm. I told you last time that Vikings had really stupid names. Harald Bluetooth went on the become saint of techno-nerds. In 1013 Svein and Canute decided to conquer England, and were extremely successful at it, soundly defeating the army of King Aethelred the Unready. Having lost the battle Aethelred immediately fled to Normandy, probably very quickly indeed considering the Vikings’ unpleasant reputation. Canute’s dad, Svein died soon after and so luckily for Canute he became king of all England, Denmark, Norway, and part of the Sweden. Result. 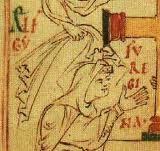 In 1017 Canute, being ready, married Aethelred the Unready’s widow, Emma, and they had two children, Harthacnut and Gunhild. Canute was a Christian and very religious-minded, however, like many religious maniacs in history, ( or even now) his religious beliefs didn’t get in the way of him behaving badly, including having two sons, Harald and Svein with his English mistress, Aelfgifu. Canute had great respect for the old English laws, other than the ones about adultery, obviously, and he tried to repay for the bloody wrongdoings of his Viking forefathers by building churches and making many generous gifts. He is remembered too for trying to teach his courtiers humility, saying on the beach one morning, ‘not even a king as great as me can hold back the tide’ – then proceeded to get completely soaked. After ruling successfully over a huge yet peaceful kingdom for twenty years, Canute died in 1035 aged about forty. He was buried in Winchester, where he normally lived when not touring his kingdom, or down at the beach. Canute’s sons, turned out to be weak and not that sturdy. In fact, Harthacnut died only two years later, remembered for nothing at all except for the huge taxes he imposed. There are few governments who could benefit from that lesson. 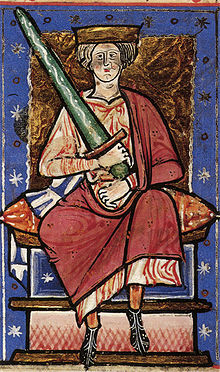 None of Canute’s sons had any children so Emma’s son, Edward, by her first husband Aethelred, returned from Normandy in 1042 to become King Edward the Confessor. On his death he became the saint of difficult marriages, and, coincidently, the British royal family. Canute tended to fade from history for many years, but now his rein is being re-examined by historians as one of the great success stories of British history. He did also stop the Viking raids, even if he didn’t hold back the waves. Categories: Research | Tags: Canute, Cnut, history, Knut | Permalink. 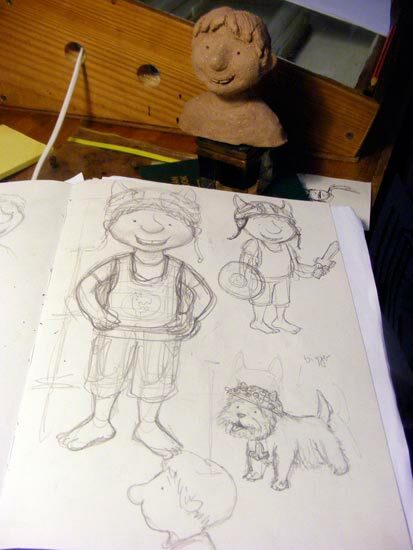 I started attending a clay sculpture class in November 2008, the year before I started working on this picture book. I find clay a great medium to work with, especially for making models of characters. I’d made one sculpture of Knut already- the big-nose version- but I wanted to make an updated version. The head isn’t very big, it fits into the palm of your hand. Then I started making the body over three sessions. Firstly, I got the basic body parts in there. No detail at this stage. I hollowed out a hole in the bottom of his head so that it could pivot on his neck. This kept the head stable. 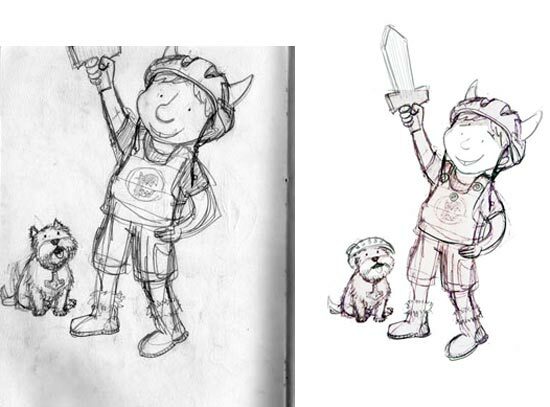 The next time round, I added a base to give him stability, and I put in the details of some clothes. Then in the third session, I put in finer details- his fingers, the stitching and the wool on his ugg boots, and I shaped his shirt a bit. I’ve left gaps in his hands to hold a sword and shield, and I’d like to make a model of Wolverine to sit beside him (that’s why the base isn’t symmetrical). I’m glad I made his head separate, because I’d like to redo it. His face is a bit flat, and his nose and eyes are too high on his head. He also needs his viking helmet! Perhaps I’ll also make some cardboard armour. So, that’s how the character of Knut developed. 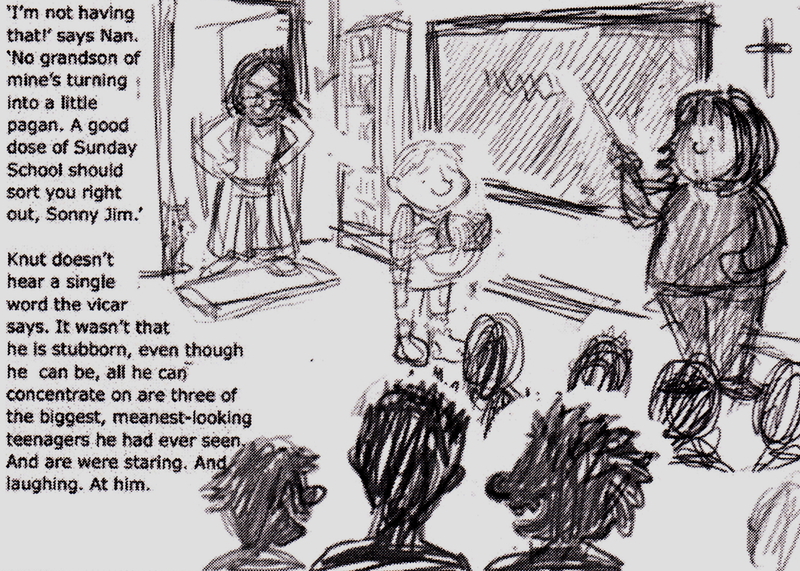 From next week, I’ll look at some of the other characters in the book. 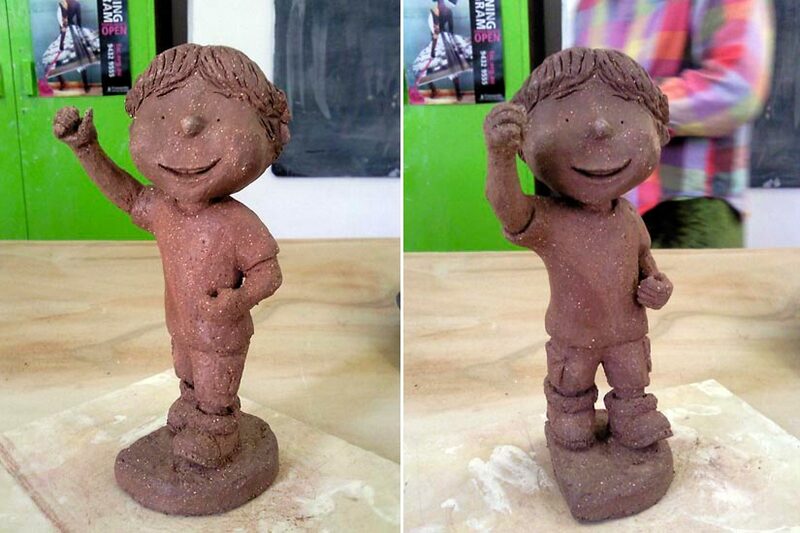 Categories: Character development | Tags: clay sculpture, Knut, round-cheek version | Permalink. The gap in the front of his teeth might need to go- kids usually only have those gaps when they’re younger, around 4-6 years old, and Knut was supposed to look a tiny bit older, around 6 to 7 years old. The size of his head, arms and legs in proportion to his body made him look slightly too old- maybe 8 or 9. Wolverine looked great and could stay as he was. Based on that feedback, I revised the character design on my computer, fiddling with the body proportions. 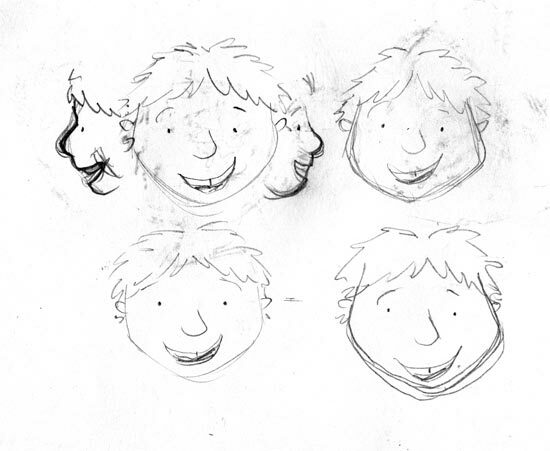 From there I started resketching the character, making the face rounder and the chin less pointy. 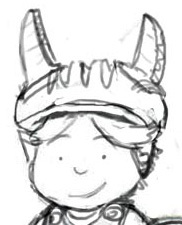 This version of Knut I call the ’round-cheek’ version. The body proportions started to look better with this version, and his character was more closely aligned with the text- Knut is a very innocent, sweet and gentle boy. His hairstyle is more consistent now too, with the two little bits of fringe coming down on either side and the little curl at the end. 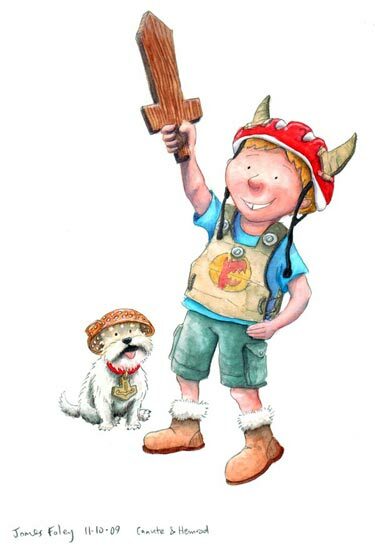 It was a lucky design, because when Knut wears his Viking helmet, his fringe pops out from the front, making him still recognisable. 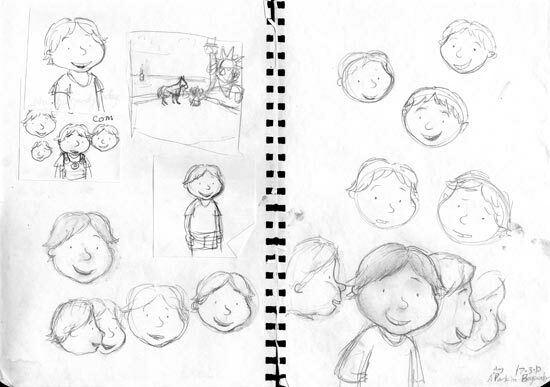 I had been working on Knut for a long while at this stage- my first sketch had been in June 2009, and the round-cheek sketches were from March 2010 onwards. Here’s how he progressed. Which is your favourite? Next week- I show you how I made a clay model of the round-cheek version of Knut. 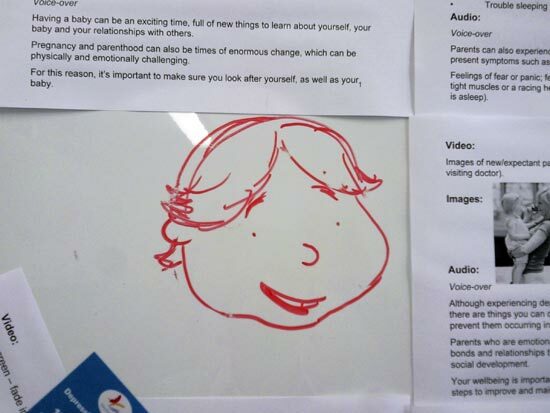 Categories: Character development | Tags: Knut, pointy-chin version, round-cheek version, watercolour | Permalink. 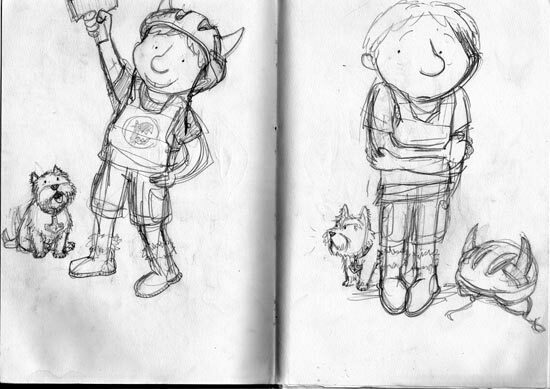 I started working on a new version of Knut, one without the big nose. 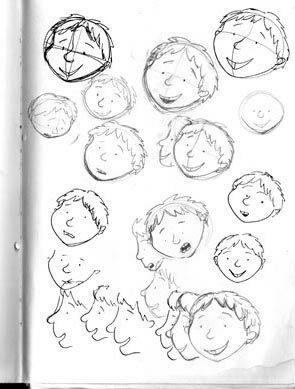 You can see here that I’m trying to draw the same face over and over again while keeping it consistent. Well, I’m trying at least! 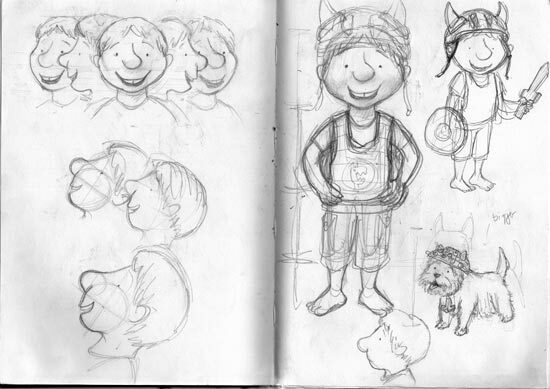 I’m also trying some profile sketches so I know what Knut looks like from different angles. I do enjoy colouring on the computer for the ease of use, the speed, and the amount of control you get- but you can’t beat the feeling of using a real brush, real water, and real watercolour paint. I reckon the finished product looks a lot better too. Next week I’ll tell you what Cate thought of the character design so far, and the improvements that were made after the meeting. 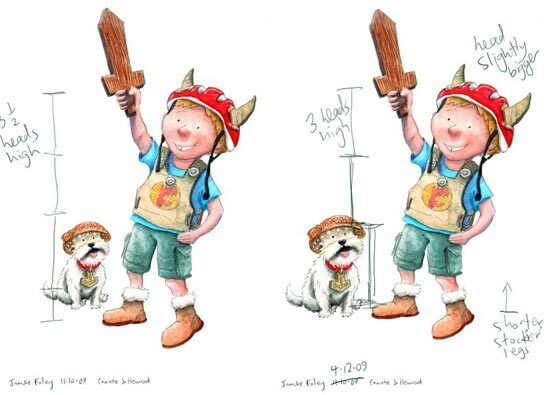 Categories: Character development | Tags: Knut, pointy-chin version, watercolour | Permalink. 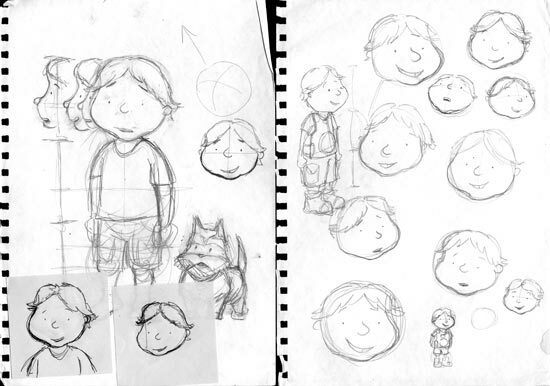 The first version of Josh/Knut had a huge nose. 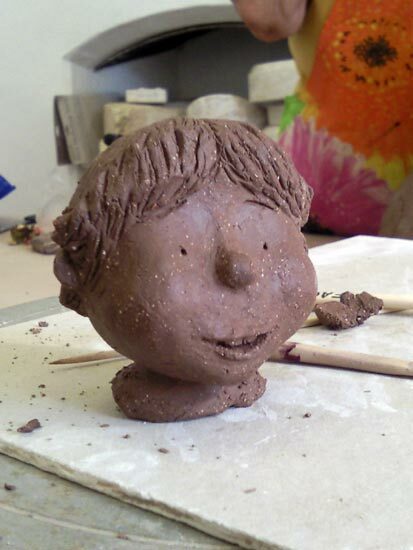 I made a small clay sculpture which seemed to be cute… but when I translated it into drawings his nose was enormous. ...but you can't pick your friend's nose. 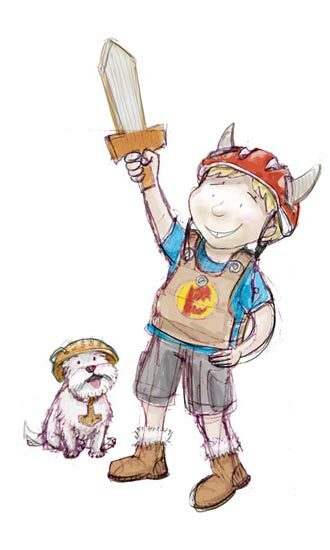 His character was starting to come through here- alternately brave and afraid, with his faithful Viking dog Wolverine by his side. But the nose had to go, it’s far too big for a young boy. Did you know that our ears and noses continue to grow for our whole lives? Babies and kids have small ears and noses compared to their head size, but older people have much bigger noses and ears. If you draw a character with big ears and a big nose, it will make them seem older. Unless of course your character is a baby elephant. In this case I’d recommend making their eyes much bigger than usual. The babies of all animals have bigger eyes than the adults, compared to their head size. Except those blind cave fish, they don’t have any eyes. And tadpoles, they’ve got tiny eyes. And… sorry where was I? Right, yes, I was getting rid of Knut’s big nose. I’ll show you some more of this version next week, including an early watercolour sample. Categories: Character development | Tags: big-nose version, clay sculpture, Knut | Permalink.